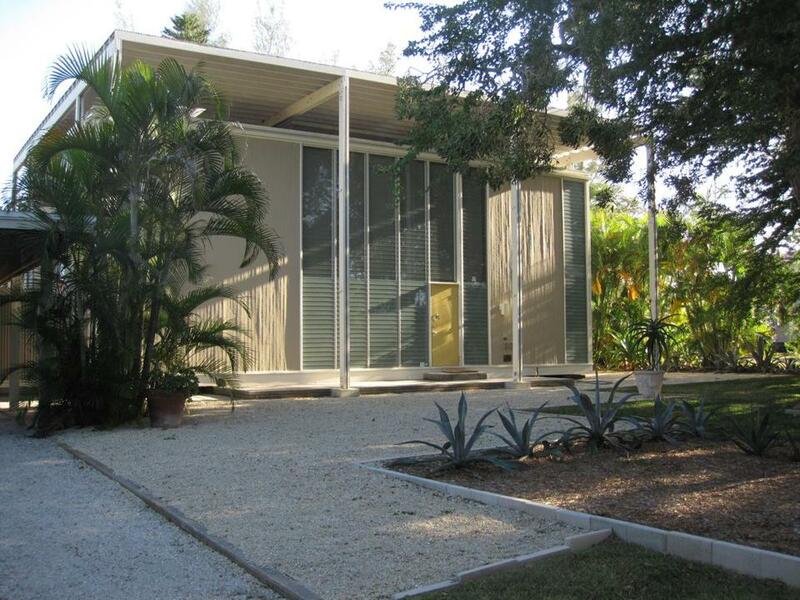 Architect Paul Rudolph’s mid-century-modern Umbrella House (1953) in Sarasota. SARASOTA, Fla. — After Vinny and Julie Ciulla bought the “Umbrella House” in 2005, fans of famed mid-century-modern architect Paul Rudolph started knocking on their door asking to see the inside. “That was a little inconvenient, so we decided to give tours,” said Vinny, who with his wife has spent more than four decades designing museum exhibitions across the country. 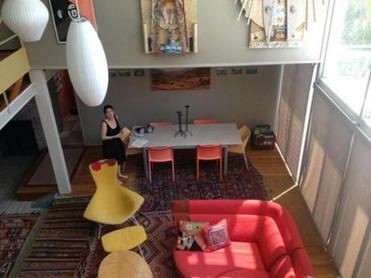 Since they opened their home for private visits, dozens of architects, students, and the curious have been treated to up-close views of the 1953 cube house. Hundreds more drive by, many stepping from their cars to snap photos. The residence, called one of the five most remarkable houses of the mid-20th century by Architectural Digest and included in the book “The American House: A Guide to 100 Iconic American Houses,” was one of the first homes built in the Lido Shores section of Sarasota. The small, upscale neighborhood, which sits just beyond popular shopping spot St. Armands Circle, remains one of the best areas in the country in which to view a high concentration of mid-century-modern homes. Lido Shores developer Philip Hiss commissioned Harvard University-trained Rudolph to design a “spec house” to show off the features of what would become known as the Sarasota School of Architecture: modern design adapted to a semitropical environment. In general, those include wide overhangs for shading, the use of glass and open air to bridge inside and out, and site placement that pays attention to shading and ventilation — all details that are again popular in current sustainable design, Vinny noted. 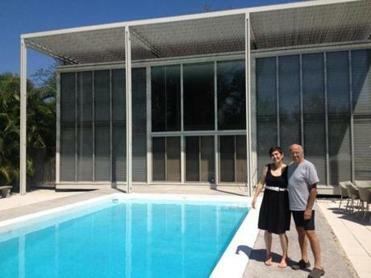 Owners Julie and Vinny Ciulla plan to extend the house’s trellis-like wooden cover (“umbrella”) to shade the pool. The Ciullas, who moved to Sarasota from Brooklyn, N.Y., in 2002 to be near family, knew they wanted to purchase a Craftsman-style bungalow or a Sarasota School home. If you go to Sarasota, Fla.
From the outside, the house looks like a box and nothing like an umbrella. The name derives from a trellis-like wooden cover that shades the entire structure. The original was blown down in a storm in the 1960s and wasn’t rebuilt until after the Ciullas bought the house. “The materials are way stronger now than they were before,” said Vinny, pointing out the concrete footings and steel anchor posts. At some point the Ciullas plan to extend the shade over the pool in the back. Visitors, who are asked to remove their shoes to protect the heart-pine floors, will immediately notice many of the nine levels in the home, a relatively small 2,000 square feet but with three bedrooms and three baths. The living room and a small den-like area are sunken, while the two upstairs bedrooms are connected by a lower loft-like “bridge.” The bedrooms overlook the living room and have sliding panels that can be closed for privacy. Built-in cabinets in the bedrooms cleverly jut out into the living room to form shelves. Julie Ciulla looks up to one of the house’s nine levels: modern design adapted to a semitropical environment. Admirers of 20th-century Florida architecture will be impressed by the rows of floor-to-ceiling jalousie windows that nearly surround the house, all operable by a hand crank. Rudolph designed the house using 32-inch modules — the width of a 1952 standard Sears jalousie window. Though the home is air conditioned, the Ciullas put the windows to use for cross ventilation. While mid-century-modern buffs will yearn for period furniture, the decor is more a mishmash based on the couple’s interests and travels to several continents. “It’s not meant to be a museum piece but a living home,” Julie explained. The Ciullas don’t know how many people have previously owned the home, but many have altered the interior and exterior in some ways. But if visitors want to refer to the original Umbrella House design, they are welcome to examine a tan binder containing carbon copies of Rudolph’s original drawings. On the front it reads: A Residence of Philip Hiss Associates, Paul Rudolph Architect, June 19, 1953, and inside are pages of drawings as well as specification notes written on a manual typewriter — another visual reminder of a bygone era.